Over the last few months, Social: IRL has hosted social media for nonprofit workshops in Springfield and Kansas City, Missouri, and will soon be announcing additional workshops in Jefferson City and St. Louis, Missouri. These events have been offered free of charge to nonprofit attendees as part of Social: IRL’s ongoing education and advocacy initiative. Offering the events at no charge has only been possible thanks to the support of our series sponsors. We wanted to extend a special thank you to each of our series sponsors. Thank you Spiral16, emfluence, RAZ Mobile, and The Rocket Group. In Kansas City, we were also fortunate to form a partnership with Nonprofit Connect and the Philanthropy Midwest Conference, and look forward to working with them on future training and education opportunities. 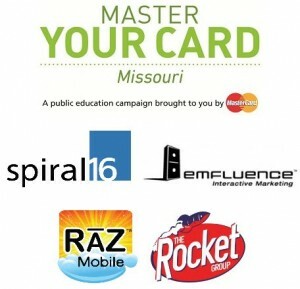 MasterYourCard is proud to be the presenting sponsor of Social: IRL Social Media for Nonprofit Organizations. Master Your Card is a public education campaign by MasterCard that helps consumers, businesses and governments get more for their money by mastering the technology behind electronic payments. Although MasterCard is based in New York, its heart is right here in Missouri. The heart of their work is safely processing millions of transactions a day from all over the world. And, every one of those transactions happens right here at their facility in St. Louis, Missouri. We invite you to learn about the safe, simple and smart financial solutions available from MasterCard through its electronic payment network. Visit masteryourcardmo.org for more information. Thank you again to each of our sponsors. These events would not be possible without their support. You can learn more about MasterYourCard and how they can help empower your nonprofit organization by watching this short video. Great resource for anyone in the social “sphere” … a must for nonprofits that want to stay ahead of the digital curve (and proper from it)! Thanks for putting this on for KC!